Played a bit today with Google Trends to see whether it might be useful for education research. Conclusion is ... perhaps. For instance, this search for "Common Core" amongst the 50 states from 2010-present yielded potentially interesting data. The key, obviously, is to have very clear language that would not be used for other purposes. "Common Core" is probably a good example of a term that would work but "technology leadership" wouldn't work. 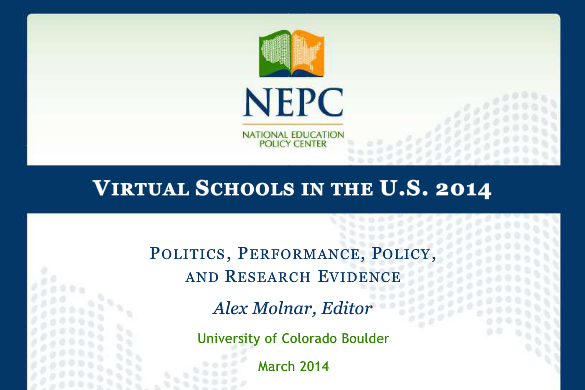 This is the second consecutive year of this report and it is quickly becoming the standard for virtual school policy in the United States. Just make a note of it ... this is going to be a legal problem for schools. It might be a few years out yet, but it is going to be an issue. We are already placing RFID chips on students in many districts and so it is the next logical step to just integrate the technology directly into the school uniforms. If you want some more academic background on smart clothes and the current and future possibilities, it is worth checking out this symposium that was held at Radcliffe Institute at Harvard. What do you think? Any reason to worry here? Lots of folks seem okay with the RFID concept, so this just seems a logical (and perhaps acceptable) extension of that. For those interested in applying to the Ph.D. program in Education Sciences through the Leadership Department at the University of Kentucky, in which CASTLE faculty are associated, the deadline is nearing. These quad copters are going to be really big. Love this TED Talk. What are some of the implications of quad technology for schools? Could quad copters one day be the new school busses?